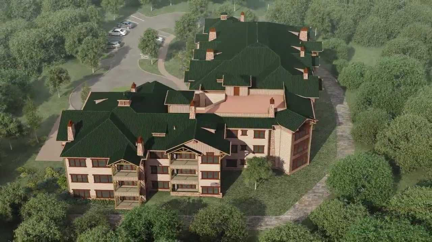 South Peak Condominiums is part of a large development that includes a mix of hotels, restaurants, retail, office, and residential establishments located in Roanoke County, Virginia. The residential units, in particular, are wood-framed structures that include a combination of 1, 2, and 3 bedroom units. These condominiums sit on top of a concrete podium slab, which also serves as the ceiling of a parking garage for the residents. KEC’s primary objective was to design the structural podium slab, and the supporting columns and footings. As part of the design process, KEC developed a graphical load-diagram indicating the loads imparted on the podium level from the wood frame above. The slab was designed as a 2-way post-tensioned slab using unbonded tendons.